Members of the Deaf community who would like to participate are invited to join this workshop at no cost. Please enter your registration code at checkout. Registration for current SCRID members. To join go to SCRID.org and click "Join Us". Presents a FREE Members-only Event! Target Audience: Members of Southern California Registry of Interpreters for the Deaf providing ASL-English interpretation in Southern California. This workshop will be conducted in ASL and no voice interpreting services will be provided. Tactile interpreting services must be requested by October 1, 2018. This ethical decision making workshop is ideal for aspiring, newly-established, and established interpreters interested in more fully developing the hard and soft skills requisite to effectively navigate this profession. Participants will be lead through analysis of extra-linguistic knowledge, experience, and beliefs as they impact choices made before, during and after assignments. A variety of case scenarios will be presented, and participants will have the opportunity to assess these scenarios as well as personal approaches to preparing for and delivering within our profession. Participants will identify and define at least three terms presented during the training relating to power and privilege, and use them appropriately in group discussions. Participants will describe at least two ways in which extra-linguistic knowledge affects interpreter's understanding of their responsibilities to Deaf consumers. Participants will describe at least two roles which can be effected by their understanding of extra-linguistic knowledge and how they affect decision-making during the interpreting dynamic. Participants will identify at least three systems and institutions of privilege and oppression that impact the way in which they view their personal power and privilege and those of the Deaf and hearing consumers with whom they work, and how each affects their decision-making in managing power and privilege during the interpreting dynamic. Given the complex dynamics and responsibility inherent in interpreting work, participants will describe at least two aspects of entering the interpreting profession for which they must prepare, and at least one way for each aspect in which they will prepare for the challenges they will face regarding power, privilege and oppression. Participants will describe how preparedness for and decisions made relating to their profession impact the integrity of their work. Roberto Sandoval is a native of San Diego and currently lives in Los Angeles. 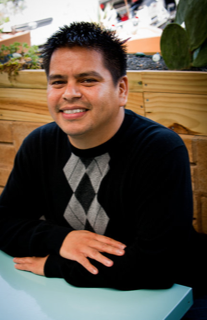 He has served on numerous committees and boards of Latinx Deaf, DeafBlind, DeafDisabled, Hard of Hearing and Late-Deafened (DDBDDHHLD) and sign language interpreter organizations. SCRID is an Approved RID CMP Sponsor for continuing education activities. This Professional Studies program is offered for 0.6 at the “Little/None” Content Knowledge Level. Anyone requesting CEUs must sign the Activity Sheet & arrive on time. Partial CEUs will not be granted for this workshop. CEUs will not be granted to those who are admitted 15 minutes late.